Find answers to common questions about health insurance coverage and undergraduate travel requirements. Am I required to enroll in GeoBlue if I am a citizen or dual citizen of some other country? you are enrolled in a health care plan in that country. Usually, most dual citizen students are permanent residents of the U.S. We ask students, “If you got really sick or injured and you couldn’t continue with the program, where would you want to recover?” The answer is usually “home,” which often means here in the United States. The GeoBlue plan covers the costs of medical evacuation to your home when it is in the United States. I plan to travel to more than one country during my stay abroad, but the drop-down menu for countries only allows one. What do I do? Choose the country where you will spend the majority of your time. Your policy is valid anywhere you travel abroad during the coverage dates. What if my study abroad provider offers a similar overseas health care plan? Northwestern University generally requires that all its students purchase an GeoBlue policy for university-sponsored international educational experiences because it ensures the highest level of coverage and care. However, most Northwestern-run programs include the cost of insurance into their program fees, so there is no need for such students to enroll (and pay) again. Furthermore, the quality of other schools' international health care plans was generally poor in the past. However, the market has changed with the Affordable Health Care Act. Some of our providers now include high-quality insurance products and 24/7 support services, and some other providers work with GeoBlue, too. We now allow some students to opt-out of the Northwestern GeoBlue plan. See a list of exempted providers. 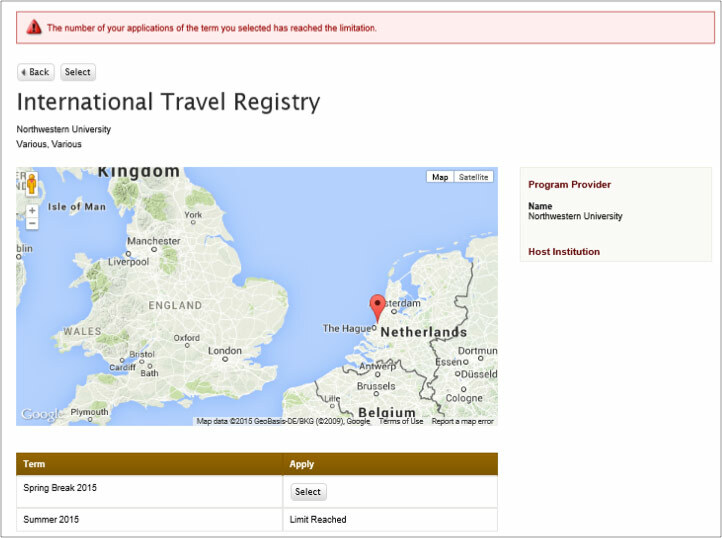 Why does Northwestern require that I maintain my domestic plan while abroad? Although GeoBlue applies only while abroad (and not in the United States), Northwestern University’s Student Insurance Office requires all full-time students to maintain [domestic] health insurance coverage during study abroad enrollment to avoid any gaps in coverage in case a medical emergency abroad requires the student to return home early for continued treatment or recovery. I need to show proof of enrollment in an international medical insurance plan in order to obtain my visa, but my travel dates are not confirmed (and therefore I can’t enroll). What can I do? Students who are enrolled in GeoBlue who need to show proof of insurance for the purpose of their visa application (or scholarship application) can now download a letter directly from the GeoBlue students site. Log into https://www.geobluestudents.com/, create an account and download the visa letter. See the attached screenshot. For employees who need proof of insurance for visa purposes, please contact the Office of Global Safety and Security (OGSS) for assistance. OGSS will need the employee's full name, date of birth, destination, and travel dates. Please allow 2-3 business days for personalized visa letter preparation. Can my fiancé or domestic partner qualify as an accompanying spouse for purposes of enrollment? If I have already traveled internationally with Northwestern over spring break, do I need to complete the Canvas course again for my summer travel? Students traveling on multiple trips only need to take the Canvas course once per academic year. 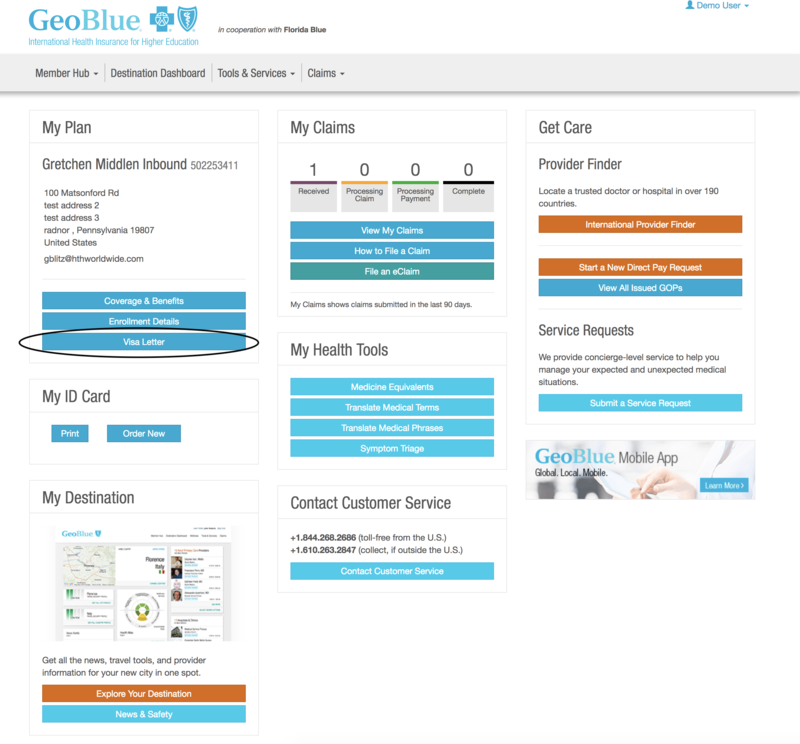 How do I determine my GeoBlue insurance coverage dates? You must be covered from the date you arrive at your destination through the day you return home. For example, if you have an international layover on your way home, make sure that your GeoBlue insurance covers you through your layover until the day you return home/to Northwestern. Can I “Google” GeoBlue and purchase the commercial policy? For Northwestern-sponsored travel, you must purchase Northwestern’s GeoBlue insurance policy (which is more comprehensive and has fewer exclusions than GeoBlue’s commercial policies), which is only available through the Northwestern GeoBlue portal. GeoBlue offers commercial policies available for leisure travel. When I try to enroll in the International Travel Registry, I see the message, “Limit Reached” and a screen like the picture below. Why can’t I enroll? The message shown above is a nuance of our on-line application, which will not allow students to apply/register twice in the same term. Contact us at globalsafety@northwestern.edu to resolve this issue.